Note: this post is expanded from one in my old blog, The Games of My Life. Most retro games here so far have been on the ZX Spectrum, due to that being the computer of my childhood and early teenage years, but later on I also had a Commodore 64 that I bought second-hand, one of the original models, which looked a lot like a bread box (which was actually one of its nicknames). Although I only had one quite late in its life (I think it was 1989 or so, and the C64 was released in 1982, the same year as the Speccy), there were some unforgettable masterpieces for that little 1 MHz (!) beast that I played even then. This, System 3’s Last Ninja 2 ((note that the first game is The Last Ninja, but the second one lost the “The“. )), is certainly one of them. If you’re not a graphics junkie (or even if you are, but are able to see games in the context of when they were released), get an emulator and the game (or buy it for the Wii Virtual Console for 500 points), and try it for yourself. You’ll truly appreciate how sad it is that games like this are no longer made; these days it seems that almost all games are first person shooters, sports games and MMORPGs. 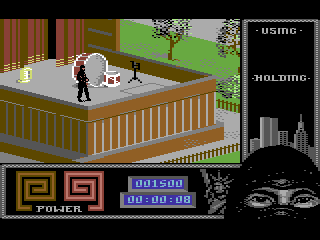 Tip: even if you, at the time, finished the Spectrum version (or even another one, such as the quite inferior(!) Amiga, NES and PC ports), try the original C64 version. It’s the only one that really “got” it.